For some, Akira (1988) is the granddaddy of all Japanese animation. Now, 17 years later, director Katsuhiro Otomo is releasing his next film, Steamboy. It’s not as if the industry has lain dormant for 17 years, waiting for Otomo’s return. Hayao Miyazaki and Studio Ghibli have won over animation fans, and two Ghost in the Shell movies have made a splash, all since 1988. Visually, Otomo has still got it. The look of Steamboy is very impressive, and it takes anime into new territory (specifically, the industrial revolution in England). 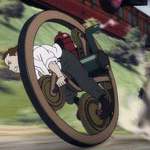 But storytelling and philosophy don’t measure up, making Steamboy a mixed bag. Perhaps he shouldn’t have waited all those years. Gramps and dad (voiced by Patrick Stewart and Alfred Molina, respectively) are away in Alaska, working on a project. Gramps ship home to his grandson the “steamball,” an iron ball of such high pressure and density that it can power just about anything. It’s basically atomic power, but we’ll call it “steam” to make it fit in this universe. No sooner does James Ray Steam (voiced by Anna Paquin) receive the ball than gray, villainous men show up to claim the ball for the O’Hara Foundation. But gramps warned Ray not to let the ball fall into the wrong hands, and a rousing chase scene ensues, Ray on his home-made unicycle and the O’Hara thugs in their trackless locomotive. Ray is almost able to hand the ball to a confidante of his grandfather, Robert Stephenson, on the train from Manchester to London, but he is kidnapped by an airship and taken to the O’Hara Foundation where, to his surprise, he meets his father. Dad and gramps are on opposite sides of a philosophical debate about nuclear power (oops, I mean the steamball). Dad wants to use it to build weapons, while gramps takes a more Luddite approach, preferring to destroy the technology so that nobody can use it for any purpose. Unfortunately, Steamboy doesn’t offer us any middle ground in this debate, and it favors gramps’ worldview over dad’s: power is the danger of technology. Maybe millennial Japan is still haunted by ghosts of Hiroshima. The conflict takes shape as the O’Hara Foundation and Stephenson’s company vie for arms contracts at The Great Exposition of 1851, set to open in three days. Their demonstrations to arms buyers include tanks, steam-powered soldiers, flying suits, submersibles, and all manner of fanciful contraptions. Most impressive is the flying castle that dwarfs the battlefield and threatens to destroy the city. Frankly, the story doesn’t do much for me, and the shallow, black-and-white debate over the use of science and technology is simplistic, verging on wrongheaded. But the movie does offer entertainment in other areas. Foremost is the impressive look of the film. Otomo and his animators really captured the bright, optimistic feel associated with that era. The icon of imperial pride, The Great Exhibition at The Crystal Palace adds plays a prominent role. Outside, the skies are blue, hills are green, and man’s great machines are polished, painted, and presented with pride. Inside the machinery, however, things are dark, washed of color, and dripping with oil and soot. The surround sound is particularly good, too. Often I’d look to my left or right to see what was happening, only to realize that it was a sound effect of the movie. According to the press notes, sound designer Keiichi Momose broke new ground, employing over 900 tracks on Steamboy (“compared with the 40 or 50 usually used for Japanese films”). Believe it or not, the audiovisual feast is almost enough to earn a recommendation, particularly for fans of animation, anime, or Akira. But compared to recent greats like Spirited Away or Ghost in the Shell II, Steamboy is a little disappointing, and not worth a 17-year wait.